Knock John ... A Brief History. Details: HMF Rough, HMF Sunk Head, HMF Knock John and HMF Tongue Sand, known as 'His Majesty's Forts', were built by the Navy and originally had a complement of about 100 men who were assigned to them before deployment. These were designed as a reinforced concrete pontoon measuring 168 by 88 feet supporting two hollow cylindrical towers, 24 feet in diameter, which were topped by a gun deck, an upper deck and a central tower unit which controlled radar equipment. 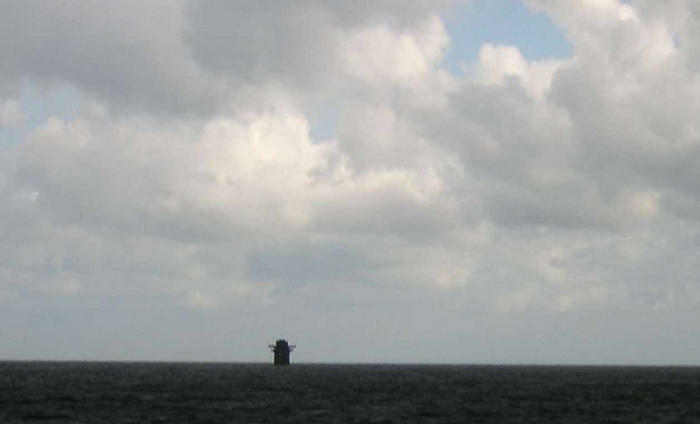 They were constructed in harbour and on completion were towed into position by three tugs and then sunk, leaving only the large diameter towers and platform showing above sea level. They were operable within 30 minutes of 'launching'. The tower 'legs' were divided into seven floors, providing accommodation and storage areas. There was a steel framework at one end supporting a landing jetty and crane which was used to hoist supplies aboard. 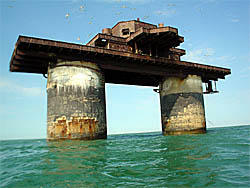 Knock John Fort, the final Naval Sea Fort was placed in position twelve miles off Herne Bay in Kent on August 1st 1942. Information used with kind permission of OFFSHORE RADIO GUIDE .... click here to see original page.